I Love You More Than Carrots: Grace For Moms or Do We Just Need More Coffee? Grace For Moms or Do We Just Need More Coffee? As moms we talk a lot about grace- whether it's extending grace to each other while we're in the trenches of motherhood or bestowing it upon ourselves without feeling guilty or undeserving. I wish someone had told me years ago not just how difficult mothering is but also how those feelings of survival that became second nature during the newborn period would pretty much unpack their bags and move in like an awkward, unwelcome family member during the child-rearing years. Here I am, five years into have kids and most days I still feel like I mother in survival mode. Just last night I mentally high-fived myself once all three boys were asleep for making through yet another day without losing anyone or winding up in the emergency room waiting area. You laugh but it's true! Even when we're in the confines of our own home I find myself counting heads roughly every third minute of the day. "Carter, have you seen your brother?" "Was that the sliding glass door I just heard open?" "Where's the baby!?" While the answer to that last one is most usually "duh, you're holding him, Mom!" And don't get me started on the MMA-style fighting that seems to be inherently linked to the Y chromosome. I try to be Big Strong Boy Mom and not worry unless I see blood because as the saying goes "boys will be boys" but really that saying should be "boys, you have nice faces! Let's keep them that way and how about you be a little considerate of how mom doesn't want to spend her afternoon waiting for someone's broken arm to be set." As a mom I've learned to be extra grateful for new mornings (and coffee). No matter what events transpired the day before, a new morning (and coffee) is like an automatic reset button. I yelled too much the day before?... Well I won't today! We didn't do enough fun activities outside before the weather got too hot?... Today is a new day! Sometimes these new mornings get me a little carried away what with all the grand plans I make for the day (ie: no yelling or free time with play-doh, both equally high up on the Fat Chance That's Happening list) but regardless of the likelihood of whatever plans I make coming to fruition, it's nice waking up each morning with a clean slate. 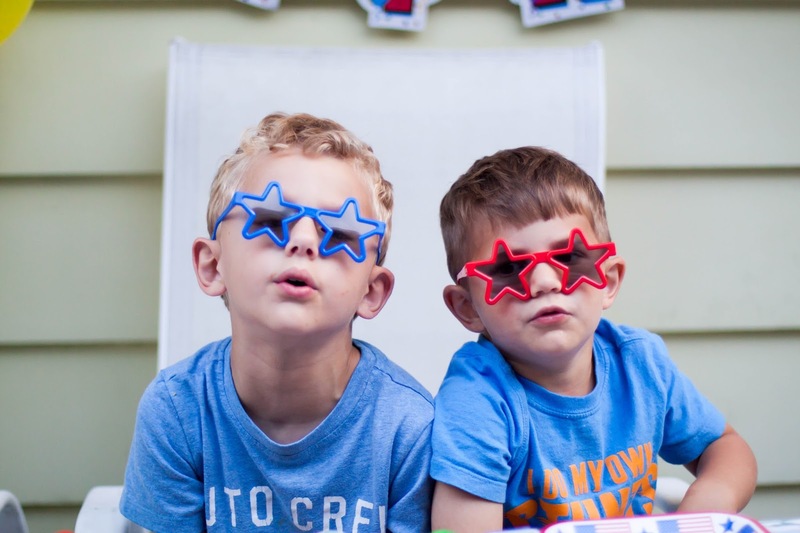 A new day to be the kind of mom my kids need me to be. But not until I drink that first cup of coffee and bonus points if it's during a moment of peace and quiet. It wasn't until I became the mom of three small children that I truly came to appreciate two things in life: space and coffee. With a little bit of each of these two things to myself each morning, it's all I need to prepare myself to take on the day. Coffee-mate understands the struggle. This summer they've partnered with Target and celebrity designer and artist David Bromstad to bring a fresh new start to morning coffee. 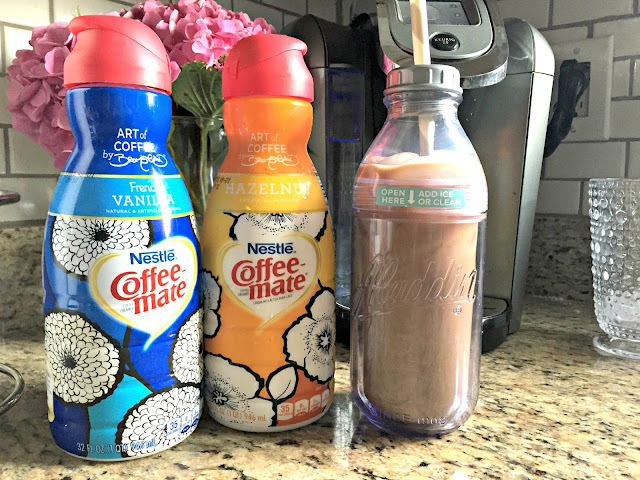 The limited edition bottles feature creative wrappers designed by Bromstad himself and are available in both the French Vanilla and Hazelnut creamer flavors. These bottles are sold exclusively at Target through September 5, 2015. Even though my "day" may have started shortly after last night's bedtime what with the wake-ups and the "I want waters" and the "my covers aren't right," when I pull open the doors to my fridge in the morning and my half-open eyes fall upon those brightly covered coffee creamer bottles, I can almost hear the angels singing. Or is that baby? Anyone seen the baby? To see a fun little video on how I take my morning coffee and find inspiration with every sip, head on over to Instagram. To celebrate the newly designed product release, Coffee-mate and Target want to give one lucky ILYMTC reader a $200 Target gift card. They say it's so that you can snag one of the Bromstad-inspired bottles for your own home but I think it's so that you can fuel up on $200 worth of coffee just to make it through the week. Whatever you decide to do with the $200 entry is easy and can be done using the Raffelcopter widget below. Good luck and be sure to keep up with Coffee-mate online, Facebook and Twitter. This is a sponsored post by NESTLE Coffee-mate. All reviews and opinions expressed in this post are unbiased and based on my personal view. This prize was provided by NESTLE Coffee-mate, but NESTLE Coffee-mate is not an administrator or connected in any other way with this giveaway. The Bullseye Design, Target and Target GiftCard are registered trademarks of Target Brands, Inc. Terms and conditions are applied to gift cards. Target is not a participating partner in or sponsor of this offer. I just like mine hot, strong and sweet, in the morning. In the afternoon/evening I'm al about that Iced Coffee. I could use a target gift card! Thanks for the chance to win! Lots and lots of sugar! Peppermint mocha creamer year round and 3 packets of equal times 2! I feel like if I could I would take mine as an IV drip! Mom like is rough, but I love it :) I like my morning coffee hot with stevia and. half and half. afternoon coffee cold brewed! I like mine with lots of flavored coffee mate creamer! Working mom of 2 soon to be 3 girls! I prefer mine handed to me already made...but that's rare in a house with 4 kids and a husband who heads into work early so he can make home to help with dinner and bedtime! LOL! I like to drink a big cup of coffee on the balcony before my son wakes up. That quiet time outside helps me gear up for what is always a fun but tiring day. I like my coffee extra hot and also when it's super quiet, though that's very rare! I like to drink a cup of coffee on my balcony before my son wakes up. That quiet time outside helps me gear up for what is always a fun but tiring day. A good splash oh half and half! French vanilla creamer with splenda and usually on the run!! Most days I don't get to enjoy the first sip until preschool drop off is done! This time of year when it's well over 100 degree every day, I prefer it iced with a splash of peppermint mocha creamer. I love that I can buy that creamer year around now! My 1 cup a day is something I really look forward to when the alarm goes off at 4 am. I didn't drink coffee until I had my first son five years ago and now with my third I'm not sure how I ever functioned without it! Funny.... I never drank coffee until abut a year ago. (I have a 13 year old and a 7 year old... daughters). Now I cannot function without my morning cup. Thanks for the great giveaway! I'm not a big coffee fan but need caffeine in diet coke form to make it through the day! A spoonful of sweetened condensed milk adds the perfect amount of creaminess and sweetness for me. I may be sipping on some coconut creamer…HOT and in a mug from our vacation. Le Sigh. I love coffee and the vanilla creamer! A new Keruig would be amazing too! Love me some coffee and coffeemate vanilla creamer! I don't drink coffee... I'm a tea person. But I'm starting to think that might change now that I've had baby #2! Coffee is my saving grace each morning. I love a nonfat mocha, iced or hot. Coffee is my lifeline, I was a coffee lover before kids but now that I'm a mom coffee is what keeps me afloat. I take my coffee with a little cream and sugar. I usually drink it hot but I do enjoy an iced coffee every once in a while. A little bit of raw sugar and hazelnut creamer starts my day off right! Have to have my cold brew with a healthy splash of coconut milk creamer, preferably the hazelnut kind! iced in the summer and hot in the winter. I like to enjoy this with my morning news reading and some baby snuggles. I love mine iced, with a little bit of cream and sugar! I like my coffee iced with just skim milk and a side of quiet. I like iced coffee in summer and extra hot in snowy days. With vanilla creamer or black. I love coffee and target! At my desk. Is that weird? That I actually prefer to be at work in the mornings? Mommy loves her adult-only time! I use creamer. The sweeter the better! I use sugar or creamer. The sweeter the better! I don't drink coffee but my husband takes it with milk and 2 sugars. I'm obsessed with iced coffee, even in the winter! Iced and with a straw. I take my coffee with Coffe-Mate Italian Cream flavor, and a side of peace and quiet. I totally know what you mean about a new morning and a fresh cup of coffee. A new start, wiping away the mistakes of the past day and the hope we won't screw these kids up too much! ;) hot coffee when I'm not pregnant and only icediced, sweet full o cream coffee when I am! I love iced coffee with skim milk and sugar. I like regular coffee with sugar and powdered creamer and I like my first cup before everyone gets up. I don't like coffee at all. I take my morning coffee with a splash of whiskey in it. I like my coffee with lots of vanilla creamer and sugar. Right now, I'm hooked on Vanilla Iced Coffee. I like iced mocha coffee. I'm not much of a hot coffee drinker. I like my coffee very hot and I like it with any of the Coffeemate creamers. They are the only creamers i use in my coffee! I agree with you, I like my coffee (iced) during quiet time before the kids are up (or are off to school). I enjoy sitting and relaxing while catching up on blogs and news. I like hot with lots of cream and sugar. I like mine with flavored creamer and a little sugar and enjoy it in the morning while reading my emails. I like iced coffee in the morning in my room. I like it iced with cream and sugar (if I'm being bad) or Stevia and almond milk (if I'm being good). I like mine hot with lots of french vanilla creamer and no sugar! I admit I put a lot of artificial sweetener and milk into my coffee. I have never been able to take it black. I always prefer hot, slightly sweet coffee. I like my coffee hot with a little bit of stevia. I live mine with a creamer in the morning and hot while I am at my computer reading e-mails. I drink iced coffee in the summer and hot coffee with creamer in the fall/winter. I love hot coffee in the mornings to help get me moving creamer! Love anything vanilla added to it! And...that sound of silence before everyone else wakes up is nice to get me thinking about the day! Either a soy mocha or an americano with a little sugar if I'm feeling fiesty. I also love a good iced coffee in the summer. i take mine with sugar free vanilla creamer! Love how you talk about the grand plans you start your day with, my plans usually last for a few hours before I'm ready for a nap and have checked one thing off my list. Bring on the coffee! I like mine with a little milk and sugar and a bit of quietness. With lots of milk and sugar! I've been weaning myself off creamer this summer, and can finally drink it black. I've weaned myself off of creamer this summer, so I can drink mine black now.